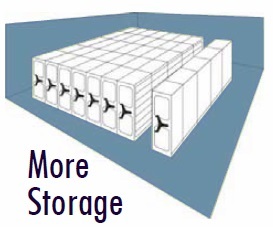 Allied Systems Products offers a variety of high density mobile storage systems for organization and space optimization. 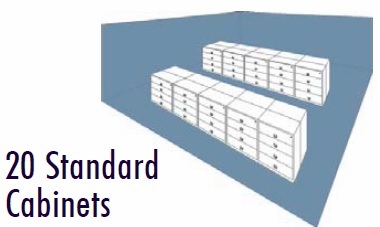 High density storage, also called mobile storage or compact storage, maximizes square footage, develops visually appealing shelves, and eliminates overcrowding. There are a lot of different items when it comes to mobile systems, so call our professional staff to help get the ball rolling on your next High Density Mobile System.. These systems are limitless and can handle anything regardless of size, shape, or weight. Stow file folders, books, binders, electronics, archival boxes, patient records, x-rays, specimens, vegetation, artwork, tools, uniforms, pharmaceuticals, rare artifacts, museum cabinets, office supplies, janitorial supplies, craft supplies, evidence, weapons and ammunition, athletic equipment, lumber, or aircraft parts with ease. High density mobile shelving systems are utilized anywhere a uniquely demanding storage environment exist such as workplaces, warehouses, factories, agricultural, education, healthcare, public safety, law enforcement and corrections, military, telecommunications, electronics, financial institutions, libraries, museums, research centers, laboratories, and government. This type of mobile storage utilizes the vertical space wasted by conventional shelving and eliminates traditional fixed access aisles with one or two movable aisles. Shelving is fastened to rolling carriages that glide apart with little force on rails. The carriages are capable of holding new and pre-existing shelving, move left to right, and are either surface mounted or recessed into the floor. The deck and rail assembly provide a heavy-duty foundation that can be adjusted for carpeted, wood, concrete, or tiled floors. An assortment of shelving styles are available varying in heights, depths and widths. No tools required to assemble; clean line design; 18 gauge; single or double entry; open or closed back; non-slotted or slotted shelves; available in 29 colors. 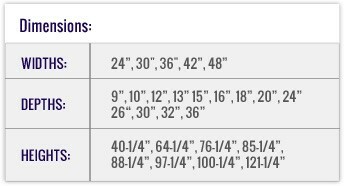 Below are all the sizes that 4 post comes in. Custom sizes are available also. No tools required to assemble; Gusseted uprights prevent contents from sliding or lodging behind uprights; 18 or 22 gauge; open or closed back; slotted and non-slotted shelves; available in 29 colors. Library shelving comes in the same sizes as the 4 post shelving. This type of shelving maximize the weight load that can be put on each shelving. It can come with metal or wood shelves. This type of shelving is highly customizable and can adapt to many environments. Carriage capacity loads of 1000 lbs. per linear ft.; electric mobile systems with programmable master control panel. Each aisle can have its own access code to secure lock certain sections down. This high density mobile shelving systems have premium aisle safety lock and mechanical safety sweep and backup systems to keep you safe and working in all environments. Carriage capacity loads of 1000 lbs. per linear ft.; manual or mechanical assist; premium aisle safety lock; ADA Compliant. These system allows the most diverse shelving types to be installed safely and secure to it. This non-mechanical system is used with smaller over units. The carriages and shelving comes in 29 Standard Color Choices. To be used on the front of each row of shelving. This would be where you would see the handle to move the unit side to side. The chainbox cover is the cheapest option. End panels can be added to add a unique look to any mobile storage unit. Used in conjunction with slotted shelves and back to center stops to divide shelves into sections. A great addition to schools, clinics and offices for conference and training rooms, or mail sorting areas. Use bin dividers for industrial and warehousing applications for parts storage or store office supplies, binders, paper, coffee service goods, training materials, children’s backpacks, etc. Customizable storage with compression seal to prevent dirt and inset infiltration. There are a lot of different options here. Too many to be listed. If you are thing Museum shelving is needed please give a call. 1-800-877-8038. Quick access end cap 4 post shelving. Locking doors lift up and slide completely back for a flush profile to the 4 post metal shelving it is attached to. Locking security door rolls smoothly up and out of view into each tier of shelving. It acts something like a garage door but on a per shelf bases. Attaches to any open shelving to create secure and convenient lockable storage. This is like a sliding glass door. An attractive display area swings up easily for access to concealed storage space. So you would put the most recent copy on this magazine door and put all the past issues behind it. These are the most common 4 post shelves. Slotted allows dividers to be used with backstops or center stops. Retractable work surface allowing for immediate access to the information needed. The shelving can be made out of wood. This can lower the cost of the project but can lower the shelving life span. The drawers allow certain material to be securely and selectively from other material to protect personal property or sensitive documentation. Concave carriage wheel that matches the convex curve of the barrier free rail to ensure smooth operation and allows unimpeded aisle access for carts or wheelchairs. For seismic mobile storage applications not allowing the carriage or shelving/other items above tip over. 4, 12” Stainless or galvanized. Usually used where there is a deck built level with the rail and this ramp is used to transition in front of the mobile shelving system from the floor to the deck. 3, 4, 6” Stainless or galvanized; for mobile shelving installations without a deck. It still allow a transition from the top of the rail to the floor. This is not used that match because everywhere there is a rail you would need these ramps on both sides. Managing your storage footprint is essential and ensures that there is enough room to meet demand and enables facilities to reduce construction costs or delays the need for expansion. Whether your project involves design of a new space, expansion, or consolidation, Allied Systems Products will provide you with creative practical solutions for an efficient use of space. 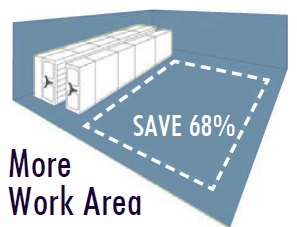 Our staff works with architects, designers, and clients to assess, recommend, and implement space saving mobile storage. Have a question? Call (800) 877-8038 or email us at sales@alliedaak.com.